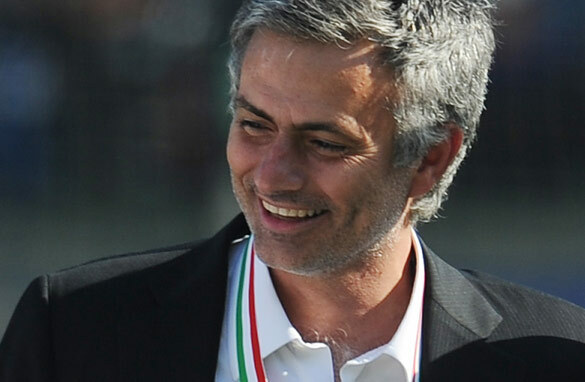 Jose Mourinho celebrates his latest triumph (Getty Images). Sunday saw Barcelona and Internazionale crowned champions of Spain and Italy respectively; in my view, both clubs were worthy winners of their league titles. Let’s start with Barça. After a historic 2008/09 season which saw them win an unprecedented six trophies, it was inevitable this year would be a letdown. There would be no way Pep Guardiola could inspire his group of players to do it all again. However, their surprising defeat in the Copa del Rey aside, the Blaugrana actually came close to another impressive trophy haul. They narrowly lost to Inter in the Champions League semifinals and made sure they would not end the season empty handed by winning La Liga on the final day with a record points total. At the center of their latest contest was a duo that has to rate as one of the best of all-time. Xavi Hernandez and Leo Messi. These two players have an understanding which led to a large percentage of the goals netted by Barcelona this season. The Spanish midfielder finished the season as the king of assists, and what can be said about Leo? Wow! 46 goals in all competitions this season, and he is not even an out-and-out striker. Simply incredible. I will express my sympathy for Real Madrid manager Manuel Pellegrini. His team set new marks for points and goals scored but the Merengues finished the season empty-handed. Even with Cristiano Ronaldo at his best, they could not overtake Barcelona on the final stretch in the race for the league title. The "Chilean Engineer," as he is known, will now have to find a new job as Jose Mourinho is expected to waltz into the Santiago Bernabeu before the start of the new campaign. Which leads me to Internazionale. They were the best team in Italy this season and were worthy champions. For the good of Italian football, I would have liked Roma to win, since it isn’t healthy for one team to claim five straight titles. However, the Nerazzuri were better, faster and stronger and deserve to celebrate another Scudetto. Diego Milito was simply outstanding in the last month of the season and it is inadmissible that he has not been selected by Diego Maradona to represent Argentina at the World Cup. Inter’s other top performers like Walter Samuel, Lucio and Wesley Sneijder will be there. They will go to South Africa as treble winners since I believe Inter will beat Bayern Munich in the Champions League final in Madrid. As far as Jose Mourinho is concerned, he has proven once more that in the present day he is the best coach on the planet. Give him the resources, and he will give you success. Guaranteed. He now has collected 16 trophies in 10 years in management. Statistics like these do not lie. One final word about England’s FA Cup final. I grew up watching these games on television and always considered them to be a showpiece of the football season. Having watched this last weekend’s match between Chelsea and Portsmouth from afar once more, I became disillusioned with everything this game is supposed to represent. There were empty seats, the fans were lethargic, and the pitch was embarrassingly poor. It didn’t look like the home of football. It didn’t even look like a field that should host a final of any sort. You really good Pedro! your articles are well written. For me it's seems like you're born English! Thanks!!! there is no doubt that Barca and inter are hotest teamsin their own countries. Bravo,Bravo. Jose Mourinho will have failed if Inter don't win the Champions League and he quits for Real Madrid. Winning the Scudetto might do for other managers, but he was hired to succeed in Europe not to win the Serie A, where Inter have once again been crowned the kings of a very mediocre league. Barca too have come out on top in a pretty lame league, which has been a two-horse race for months. Of course, both teams can only beat the teams in front of them, so credit where credit's due. But reserve the title of "great" for those who survive some real competition... As far as the FA Cup final goes – which Cup Finals did you watch growing up? The Cup Final is rarely a great game, and this one had a superb goal, 2 missed penalties, and countless shots against the woodwork, all of which resulted in Chelsea winning the double. What more do you want? I think pedro should sloely focus his job as a tele presenter. I think bayern will beat inter in the finals and for the sake of football they should. Mourinho represents the philosphy of winning at any costs and giving damn about the aspects of the game which makes it beautiful, Parking the bus tactics may win you titles and boost his ego but thats not good for the game. if mourinho triumphs, I can see more and more teams tryhing his tactics for win which I don't want to see. It is a measure of one's success the ability to make unseen friends and foes alike. Hard facts speak louder than fiction and Mourinho delivers the goods. For the (often) remarks on "parking the bus" please consider what any responsible manager aiming at the CL Finals could do when presented with a 10 man squad, hostile environment in a packed Nou Camp, and 70 minutes to go against (possibly) the most efficient goal-scoring machine there is. You surely must be joking, it was a formidable lesson on defensive footbal. Goals win matches, but defenses win championships. The art is there and both are required. Well said Pedro, thats the reality @ the moment. Mourinho is the best coach in the world. On their way to the finals, Inter disposed tougher opponents who became champions in their respective league's unlike Bayern who I think had a smooth ride to Lyon and Man U.
I think, the final is always physchological. Well done Mourinho you were paid to win and that you did you psychologically get the referee on your side, but my problem is ETO'O for SLATA HIMBRAHIMOVICH was a no no,SLATA is overrated. ETO'O goes to african cup and still scores 20+ goals and a lot of assist totally a better player in all aspect of the game from inter you can see SLATA does not shine in the big games and it shoes at BARCA, you can see ETO'O makes a big difference at INTER so i rest my case, well done ETO'O. SLATA don't even have the bounce the timing that BARCA does thats why HENRY and SLATA did not make the cut they are ENGLISH old style kick over the top and chase not the beautiful game. I believe in saying the truth irrespective of who is involved. Even if someone hates mourinho does not mean u should not analyze football they way it suppose. I quite agree with what Fernando said, goals and defenses are inseparable in a football game. Barca needed goals & Inter needed defence so what is wrong in going for what u need to get to your destination. Indeed mourinho is the best coach in the world so far, going by the statistics – 10yrs 16 trophes what a superlative achievement. It means each season he goes home with a trophy in different clubs and country. Man accept the truth .... Mourinho is the best coach so far. Pedro, I have come to respect your predictions since your article predicting Barca's CL ousting by Inter. A lot of people will think you are biased because of your nationality, but I'm sure you would bet on Byern if you truly believed they can win it. I would like to read your World Cup Predictions. Again, I think that you are smart and know what you're looking for when you watch football. Some facts: A) Ronaldo is desperate to win something, B) If you watch La Liga and the Premiership and look at the teams on paper you will be more familiar with the Portuguese team than any other team in the tournament C) We are playing at home in South Africa. D) We like the climate just fine. D) Nobody is worried about Portugal except for the Ivory Coast. Louis van Gaal is the best coach, because he makes winners out mediocre teams and wins in style. And because he fields local players! Home grown players that connect with the fans whom they recognize or know from school. As he did at Ajax ad as he did at Barcelona. Jose his team has no person from Milan or even an Italian for that matter in it! It is a disgrace for club football as it once was, it is a bunch of strangers wearing Milan shirts. The Spanish competition is effectively a Mickey Mouse competition now, in which only two teams can really compete for the title. The money recourses are divided so unfairly that it basically is no competition, they should just play two games between the top two and be done with it. Extremely boring competition in my mind were other teams are mere cannon fodder, used to build impressive goal scoring statistics. Yes, i watched games, but it is no fun watching as a neutral if the other teams have no real chance. In the long run this is a bad trend that will finally hurt the two on top as well. Nice to see Barcelona win as they at least have some locals playing for them, and still have a club team feel to them. The Italian league has been in decline steadily since the mid nighties. Inter got its chance after the scandal which saw other contenders being set back to a lower league, effectively turning the Serie A in a Mickey Mouse league for some time as well. Curious that Italian club performance in Europe has been in decline since they started to field more and more non Italian players. Germany is about to overtake Italy to earn an extra Champions League spot. The title races in England and Germany were worth watching as more teams seam to have a shot at the title. Curiously, because more teams have relatively large resources there are more contenders and more upsets from week to week. Making those title races interesting to watch. But home grown players in England and Germany? Only at Bayern and Man U. All in all I feel the quality of most competitions currently are poor since the Bosman rule change. Basically the snapshot of economic power of that time have determined the big clubs in most competitions since. No new comers, build on home grown players and youth squats, no real upsets to the status quo. No new playing styles. No teams that seem to have a supernatural understanding of were their colleagues are on the pitch. Football has been going the wrong way since. With the mass migration of players every year, most competitions have lost power and attraction. Most teams are together to short to really gel and play beautifully football. Just to tell you that 'El Principe' Diego Milito will go to South Africa . Mourinho – 16 trophies in 10 yrs, pep 7 trophies in 2 yrs. 6 in his first season at the top flight. Who is the best? will let you be the judge. if la liga is lame and premiership is the best, why is it that the best players in th world always want to play in la liga and are from la liga. again i will let you be the judge. Nice blog. Formidable Inter Milan has done well winning two major trophies and are contesting for the third one this evening against an equally strong Bayern. Pitches for the World Cup in South Africa are looking impressive. If found conducive for playing very good football, that successful pitch craft of the World Cup hosts could be tried elsewhere. Hi, i strongly agree with Platini that the media is giving too much honour to the coaches and not the players.Please the players are the main actors in a football game.Mourhino has won two champion leagues but Etoo has won three with two clubs.Etoo has won two successive champion leagues but it is not head line news.why? A coach may be very good but it takes the players to implement his instructions.Respect the players and give them the honour they due.They are those entertaining us. You missed the finer point. Messi, the best football player on the planet failed to score against a 10-man team in a span of 70 minutes! It is innate in our human spirit to recognize genius and brilliance when it is amidst us! You cannot simply attribute it to the defensive skills of Inter. You have to be naive (or Mourinho hater) not to admire the dazzling tactical plays of Inter's coach. I read a lot that Louis van Gaal is the best trainer because he is able to build a team with mediocre players. Well, Robben is not a mediocre player and without him he would have been nowhere. The best coach is he who does it with the best and most expensive players, because that is the most difficult task. To work with important players with a huge ego, is more difficult than anything. They hold power because the club has an economic interest in them playing, and the player knows that. If those players don't like you, they will make your life very difficult at a club like Real Madrid. Don't underestimate the life of a coach at Real. Not many survive. If the players want you out, they simply loose a few games and you are on your way home.